Oli Hawkins savoured Pompey moving to the summit of League One and insisted: We were always confident of defeating Peterborough. The Blues delivered a 2-1 victory at London Road to leapfrog the Posh and go top of the division. Hawkins netted his first goal of the season to break the deadlock on 62 minutes, while Jamal Lowe doubled Kenny Jackett’s side’s lead 13 minutes later. Matt Godden grabbed a stoppage-time consolation for the hosts. 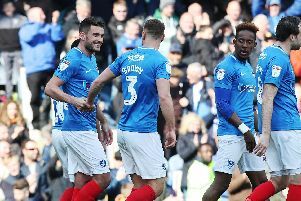 Despite facing the previous league leaders on their own patch, Hawkins was certain Pompey could grab three points at Peterborough in the build-up. The striker said: ‘We all knew it was a top-of-the-table clash and we were all very confident coming here we could get a result. ‘It showed in the result today – from the boys defensively and in midfielder to us attackers. ‘We wanted it and showed how much we wanted it by getting the win. ‘Shrewsbury last weekend was completely different to Peterborough. ‘It goes to show we can adapt. We got a point last week but didn’t panic after going a goal down and got a point.